TIBURON, CA, October 19, 2012-Jon Peddie Research (JPR), the industry's research and consulting firm for graphics and multimedia, announced estimated mobile devices graphics chip shipments for the first half of 2012. Mobile devices include smartphones, tablets, and game consoles. The market for portable devices (mobile devices that we can carry) continues to soar in spite of economic difficulties and general uncertainty. Although portable devices are not necessarily replacing the PC, they are outselling the PC. All of these devices have a graphics processor (GPU) integrated in the device's system on a chip (SoC) application processor. The application processors are made by a dozen-plus semiconductor suppliers (Broadcom, Apple, Intel, Marvell, MediaTek, Nvidia, ST-Ericsson, Texas Instruments, Toshiba, Qualcomm, Samsung, etc.). All of those companies fall into one of two categories: vertically integrated or IP buyers. Nvidia and Qualcomm are the vertically integrated companies with their own GPU designs; all of the other companies buy GPU IP from one of four IP suppliers (ARM, DMP, Imagination Technologies, or Vivante). The exceptions to this tidy categorization are Samsung, which has an internal GPU design and buys IP from ARM and Imagination Technologies, and Broadcom, which has an internal design GPU and buys IP from ARM. The leading high-volume suppliers of application processors (i.e., SoCs) are Apple, Texas Instruments, Qualcomm, and Samsung. ARM supplies GPU IP for some of Samsung's mobile phones, while Imagination Technologies' GPU IP is used in Apple, Texas Instruments, and some of Samsung's mobile phones and tablets. The upcoming SoC suppliers with impressive design wins to their credit are Intel (Imagination Technologies' GPU) and Nvidia (proprietary GPU). Other SoC suppliers that buy GPU IP are Freescale, Huawei, MediaTek, Rockchip, and Wonder Media/VIA. These companies have participated in the feature phone market, and some of them have recently entered the smartphone and tablet segment. One area that is fueling the growth of portable SoCs is the exploding tablet market in China, which is contributing significantly to the astounding growth that ARM and Vivante are experiencing. As a result of this tablet surge in China, dramatic changes are expected during the next 12 months. Apple will introduce a 7-inch tablet, Microsoft will bring out its Surface tablet, and Texas Instruments will continue to supply Amazon (even though the company is pulling back from the smartphone market as Nokia loses market share). 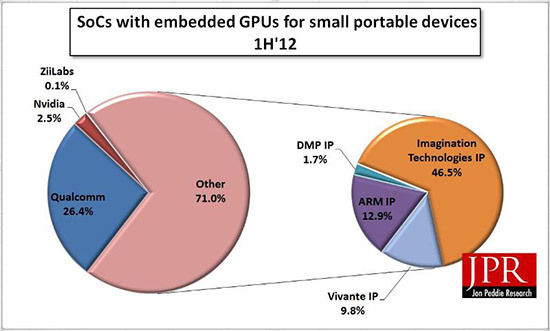 The market for SoCs with GPUs grew 91.3% from the first half of 2011, with market shifts occurring as shown in Table 1 below. As a result of the turbulence in the market, we expect market shares to shift dramatically through 2012, and we look for a new IP company to enter the market in 2013.